George Groves began his world title collision course with an impressive fifth-round stoppage of Andrea Di Luisa at London's Copper Box Arena. 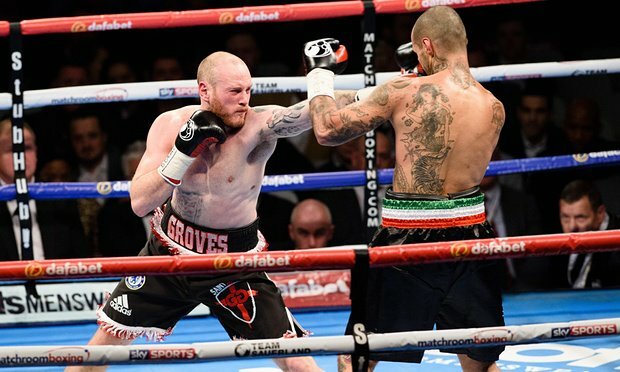 Mentally and physically, George Groves (22-3, 17KO's) was on point and proved to be too strong for Italian Andrea Di Luisa. Sporting the black and white trunks, Groves immediately acquired the centre of the ring and peppered Di Luisa with a sharp, cobra-like jab. The 27-year old easily claimed the first round; a straight right to the body followed by a sweet left hook upstairs highlighted his clear superiority over Di Luisa who looked out of his depth with a clear lack of ideas to combat Groves' success. Under new trainer Shane McGuigan, former world title challenger Groves promised an explosive performance carrying an extra 4lbs, and especially against a cherry picked opponent in Di Luisa who had been stopped several times in his career. Wildly swinging and missing, Italian-born Di Luisa was left scrambled and unsteady on his feet by eye-catching counters from Groves, many of which sharp jabs and stinging combinations to the head and body. Many expected Groves to stop Di Luisa inside three rounds mainly due to the visitors lack of punch resistance, and with Groves' increase in power and weight, but the Hammersmith super-middleweight dictated a calming pace of the fight and gradually broke Di Luisa down. During the fifth, the end eventually occurred for Di Luisa after being floored twice. After previously being floored, a swift barrage of shots on the ropes caused Di Luisa to drop to his knees in desperation. His trainer stepped onto the canvas - and when The Italian bravely beat the count - the towel was thrown in and Groves claimed a fifth-round stoppage win. Earlier on the card, John Wayne Hibbert defended his Commonwealth light-welterweight title with a 12th round stoppage of formerly undefeated challenger Tommy Martin. In a back-and-fourth domestic scrap - champion Hibbert made a rapid start and showcased every ounce of his experience over Martin - but after allowing Martin back into the fight during the midway stage - he later obtained traction and overwhelmed the challenger with a subsequent stoppage win in the final round. 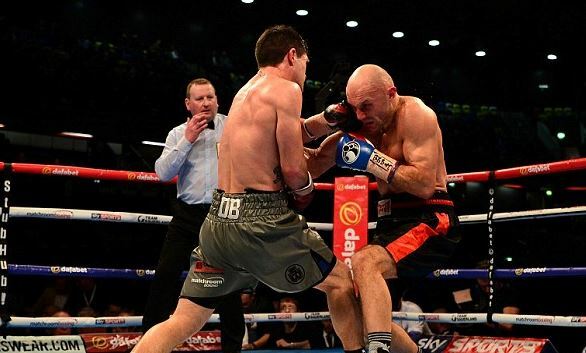 John Ryder extinguished any negativity from his knockout defeat to Nick Blackwell with an impressive unanimous decision victory over the dangerous veteran Sergey Khomitsky. Despite being cut over the eye after two rounds, Ryder weathered the storm and grinded out a hard-earned points win over the game Russian, who had previously upset Britain's Frank Buglioni and Adam Etches.